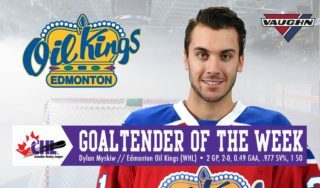 Four different goal scorers lit the lamp and Dylan Myskiw made 26 saves as the Edmonton Oil Kings (6-2) claimed a second straight meeting in the Battle of Alberta, 4-1, over the Calgary Hitmen (4-4-1) in front of 5,648 fans at Rogers Place on Sunday evening. 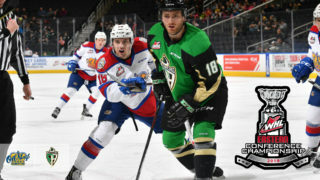 The Oil Kings lead the best-of-seven Eastern Conference Semi-Final playoff series, 2-0, with the series shifting to Calgary for Game 3 Tuesday night, April 9 at the Scotiabank Saddledome for a 7:00 PM MT start. Dylan Myskiw (3-2-0) earned his second straight win, turning aside all but one of the 27 shots he faced. Jack McNaughton (4-2-3) once again took the loss, allowing four goals on 39 Oil Kings shots. 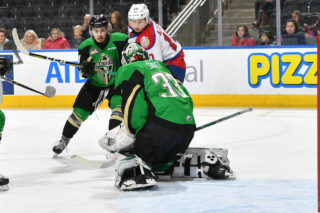 The Oil Kings opened the scoring near the midway point of the first period, as Conner McDonald – from deep in his own zone – sprung Quinn Benjafield and Vince Loschiavo through the neutral zone on a 2-on-1 break. Benjafield capitalized, making it a 1-0 game at 9:22, which proved to be the lone goal of the first period. Shots on goal in the first 20 minutes favoured Edmonton, 18-7. 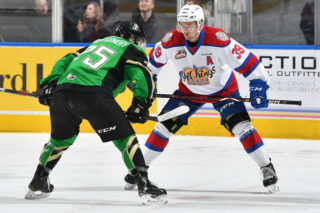 In the second, the Oil Kings extended their lead to 2-0 as Liam Keeler was credited with his second of the playoffs after a fortuitous bounce immediately following a face-off to the right of McNaughton. The Oil Kings were whistled for interference midway through the period and the Hitmen got themselvse on the board, cutting the Edmonton lead to 2-1 with a power play marker at 10:31. 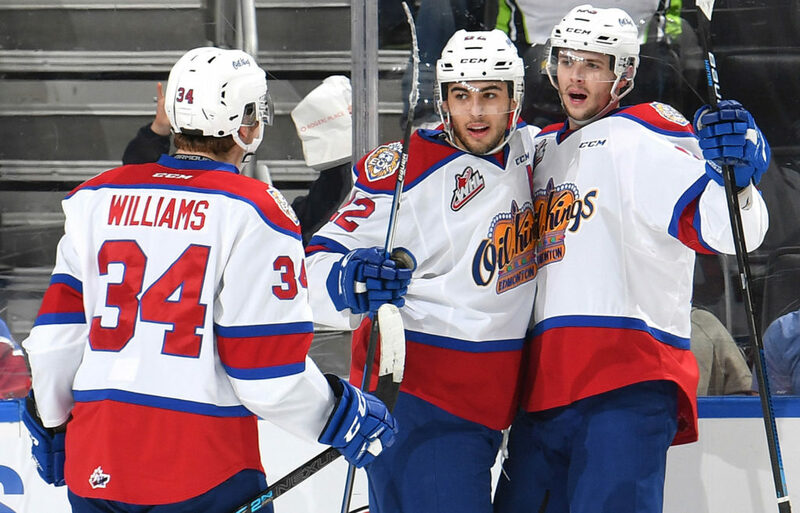 Nearly 30 seconds after killing their third penalty of the game the Oil Kings restored their two-goal lead, as Matthew Robertson unleashed a blast from the right point to make it 3-1 Edmonton, with Wyatt McLeod and Trey Fix-Wolansky earning the assists. Edmonton led the shot clock, 30-19, through the first 40 minutes. In the third period, the game grew more contentious as the Hitmen’s frustrations boiled over into undisciplined play and additional penalties. 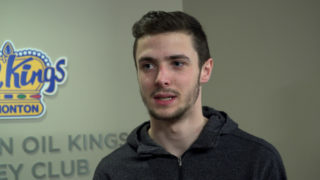 The Oil Kings power play eventually converted, as David Kope earned his first of the playoffs, from Josh Williams and Jake Neighbours at 15:46 to cushion the Edmonton lead, 4-1, and secure the Game 2 win. Shots on goal in the third period were 9-8 Oil Kings, and 39-27 Edmonton at the final buzzer. Calgary was 1-for-2 on the power play, while Edmonton finished the game going 1-for-7 with the man advantage. David Kope (EDM) (3), Matthew Robertson (EDM) (2), and Dylan Myskiw (EDM) (1) were selected as Three Stars of the Game. Wyatt McLeod, Conner McDonald and Matthew Robertson each wore an “A” and skated as alternate captains to Trey Fix-Wolansky. 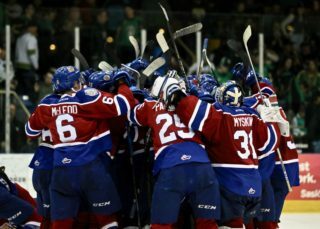 Oil Kings Playoff Passes are on sale now. Purchase your pass and secure the same great seat for every home game of the playoffs. The more we play, the less you pay! Playoff Passes are just $79/seat and can be purchased here. Join the conversation on all things Oil Kings as the team makes its push towards a WHL championship! Use the hashtag #FearTheRoar on all Oil Kings social media accounts; Twitter (@EdmOilKings), Instagram (@edmoilkings) and Facebook (/EdmOilKings).